The first inter-provincial derby of the season takes place between Connacht and Leinster at the Sportsgrounds this Saturday and Luke Fitzgerald says that there is a 'real hatred' building between the teams. 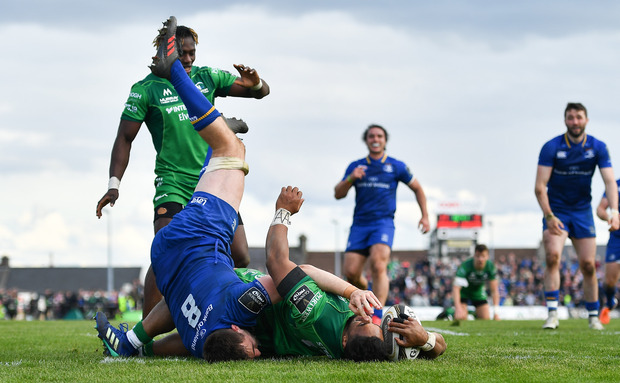 The two sides have played out some absorbing contests over the last few seasons, with the westerners coming out on top in the 2016 PRO12 final and also handing a Leinster a heavy defeat in the regular season finale last year. At the end of that game, departing legend John Muldoon attempted a conversion following a late try - which Cian Healy attempted to block - with the Leinster prop branding the novelty moment as 'disrespectful' and adding that he was looking forward to the game in Galway to get his revenge for last season's result. Speaking on The Left Wing, Independent.ie's rugby podcast, Luke Fitzgerald agreed with Healy that Muldoon's conversion was disrespectful to Leinster and added that the players would be using it as motivation for this weekend. "I would have taken that as a massive insult," Fitzgerald said. "I'd say they have a big chip on their shoulder over that. That's the kind of thing that Leo Cullen - it would be an absolute no-no to disrespect your opposition when you are beating them badly. Leinster beat a lot of teams badly last year and you didn't seem them do that. I think it left a really bad taste in their mouth." Fitzgerald added that there has been a heated rivlarly developing between the sides since two hotly contested clashes during the latter stages of the 2015/16 season. Connacht won both games and Fitzgerald says that Leinster players weren't happy with how the victors conducted themselves afterwards. "There were a few incidents after the 2016 win as well that were taken really badly," Fitzgerald said. "It happened in the Sportsgrounds a few weeks before as well. They hate us down there and there is a real hatred building in Leinster for them. After that one [PRO12 final], there were a few words afterwards. It's bad taste. It's just not classy. Real winners don't have to do that."